With Citrix PVS the content of a disk is streamed over the network to an endpoint. This requires sufficient bandwidth and an optimized configuration. If both criteria are not met the endpoint suffers from delays, retries or failures. A number of best practices apply when using Citrix PVS, most of them probably apply for your situation. 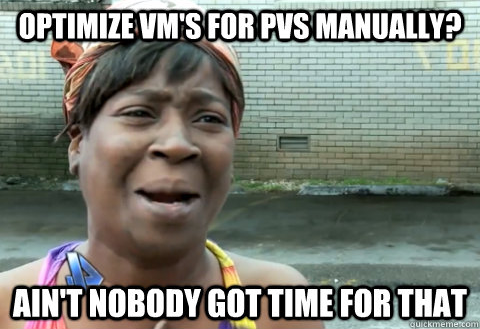 In the past I had to optimize my VM’s manually each and every time I had to create a new vDisk! Ain’t nobody got time for that (link)! I wrote a PowerShell script that optimizes the endpoint for Citrix PVS and would like to share it with you.